Monitors and graphs CPU usage on the monitored server or groups of servers. Moving Average Window: duration of the moving average window. CPU Usage Thresholds: configure the thresholds for percentage of total CPU usage. 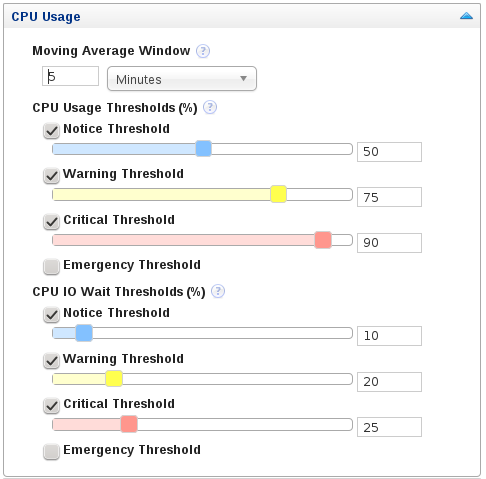 CPI I/O Wait Thresholds: configure the thresholds for CPU I/O Wait as a percentage of total CPU time. Enables detection of CPU outliers. A CPU is considered an outlier if the conditions defined here are met. It is not recommended to enable this for all Operating Systems, but for specific groups. Enable CPU Outlier Detection: Whether or not to enable the CPU outlier detection. 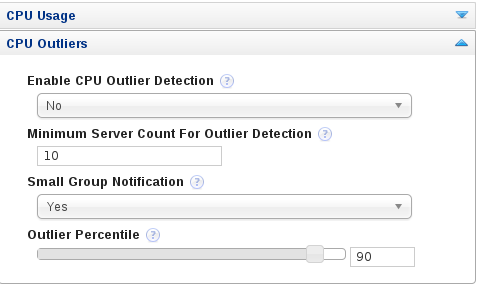 Minimum Server Count for Outlier Detection: Minimum required sample size before outlier detection is enabled. Small Group Notification: Whether or not to generate an event if the sample size is too small to enable outlier detection. Outlier Percentile: percentage, relative to the other CPUs in the group, at which a CPU is considered an outlier.